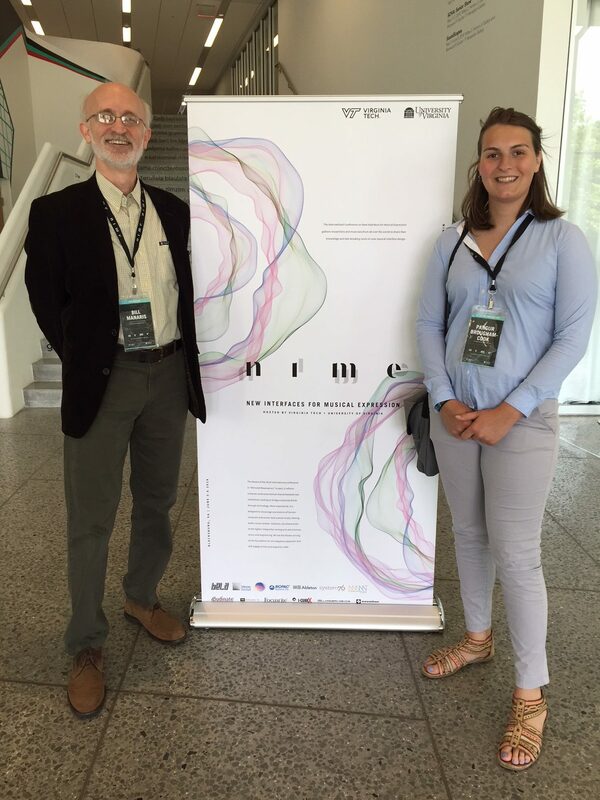 Pangur Brougham-Cook, an undergraduate research student in the Acoustics and Music Interaction lab, and Dr. Bill Manaris (director of Computing in the Arts) just presented their research with JythonMusic (http://jythonmusic.org) at the New Interfaces for Musical Express (NIME) 2018 conference (http://nime2018.org). JythonMusic is an environment for music making and creative programming and is meant for use by musician and programmers alike, of all levels and backgrounds by providing composers and software developers with libraries for music making, image manipulation, building graphical user interfaces, and connecting to external devices such as digital pianos, smartphone, and tablets. JythonMusic is based on Python programming and is easy to learn for beginners and powerful enough for experts. 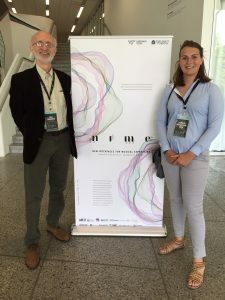 According to the organization’s website, The international Conference on New Interfaces for Musical Expression gathers researchers and musicians from all over the world to share their knowledge and late-breaking work on new musical interface design. The conference started out as a workshop at the Conference on Human Factors in Computing Systems (CHI) in 2001. Since then, an annual series of international conference have been held around the world, hosted by research groups dedicated to interface design, human-computer interactions, and computer music. The theme of the 2018 international conference was “Mirrored Resonances.” In part, it reflects a shared conference format shared between two institutions seeking to bridge a physical divide through technology. More importantly, it is designed to encourage expressions of human-computer interaction that exceed simply sharing audio-visual content. Similarly, the theme hints at the tighter integration among arts and science, music and engineering. We see the theme serving as the foundation for an integrative approach that will engage artists and engineers alike.